Sophronia Angelica Temminnick's mother is at a loss. She managed to raise Sophronia's sister Petunia into a presentable young lady, just months away from her coming-out ball. But at age 14, Sophronia's not even managed to learn a decent curtsy. If she keeps finding her way into dumbwaiters and upsetting trifles, she'll never be fit for polite society. A representative from Mademoiselle Geraldine's Finishing Academy for Young Ladies of Quality, though, seems to see some potential in her, though. So she is packed into the carriage with Mme. Geraldine and two other young people, and sent off to finishing school that very day. This isn't exactly what Sophronia imagined a finishing school to be, however. For one, it's located in a dirigible, floating above the moor. For another, along with dancing and fancy dress, the students of this school learn the appropriate ways to faint for distraction and making a scene, and how to defend themselves in a variety of ways. In fact this finishing school also has a sibling-school, Bunson and Lacroix's Boys' Polytechnique, training up evil geniuses. Sophronia has found herself in a finishing school for spies and assassins; with her natural inclinations, perhaps the best finishing school out there for her. Life in a dirigible-bound spy school has its perils, however. On the way to the school Sophronia's carriage is accosted by 'flywaymen,' intent on stealing some sort of prototype that they believe is on board. Thanks to some quick thinking from all aboard, the carriage eventually escapes and makes it to its destination, but the flywaymen are hardly finished with them. In fact, a series of attacks on the school itself has driven it into hiding amongst the fogs of the moor, but they can't stay in hiding forever. Someone will have to find this prototype, and discover exactly why it is that these flywaymen want it so badly. Someone like Sophronia. Readers of the Parasol Protectorate series will feel right at home in this book. While this takes place well before the events of Soulless, there are quite a few familiar faces that come out of the woodwork here. Because Sophronia was raised in a 'conservative' household without much exposure to the supernatural, the rules of the world are shown to the reader quite early on and reading the other books isn't required to understand the story. This is, however, very firmly a young adult book. The plot is much simpler and cleaner than in the Parasol Protectorate books, and the language is standard modern English as well. Because of this, the book is a bit less dense, but still quite engaging and exciting. Highs: As the story progresses, more and more familiar faces come out of the woodwork. Lows: Because it is a young adult book, it's quite a bit more of a fluff piece than Carriger's previous books. 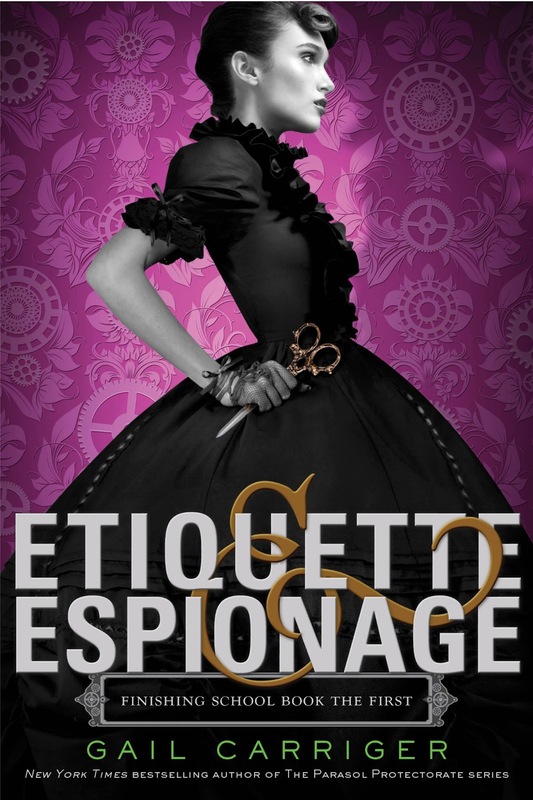 Verdict: A nice introduction to the Steampunk genre for the younger crowd, Etiquette & Espionage is a quick, fun read for any age.